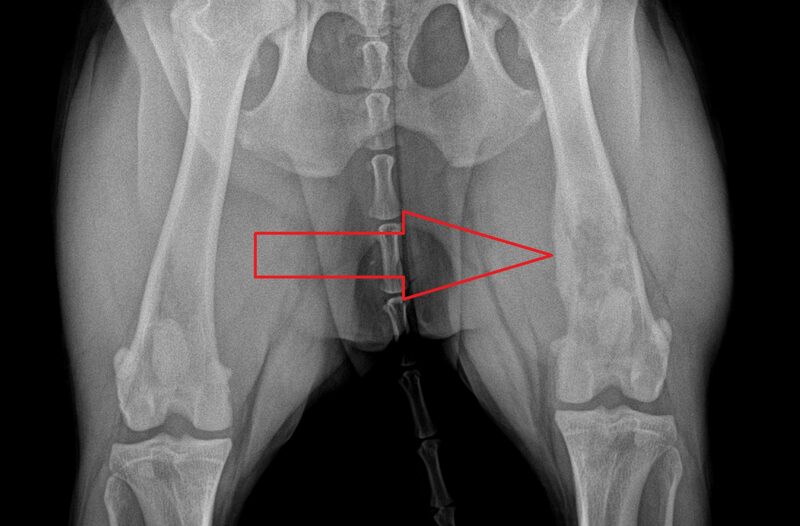 Lucy, a sweet 6 year old Golden, started limping in her left back leg. 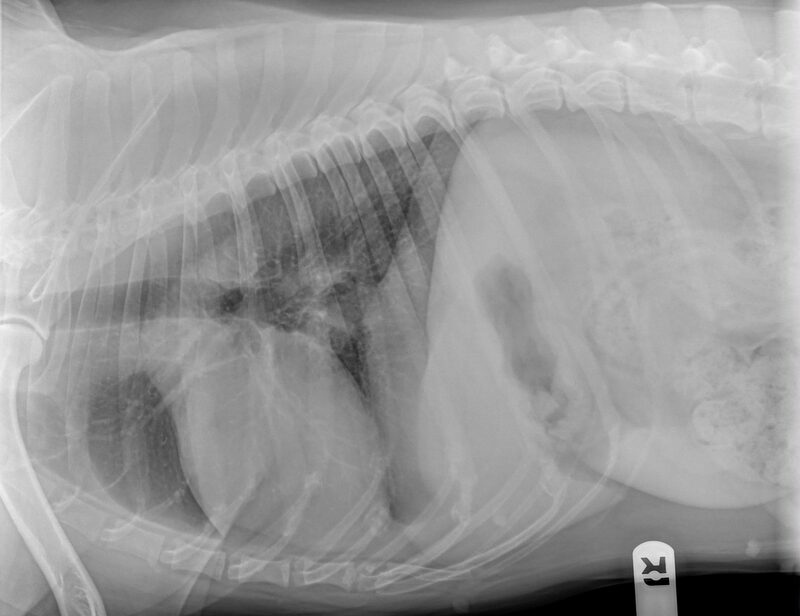 Her family vet’s X-rays showed that something, most likely bone cancer, was eating her thigh bone away (femur). 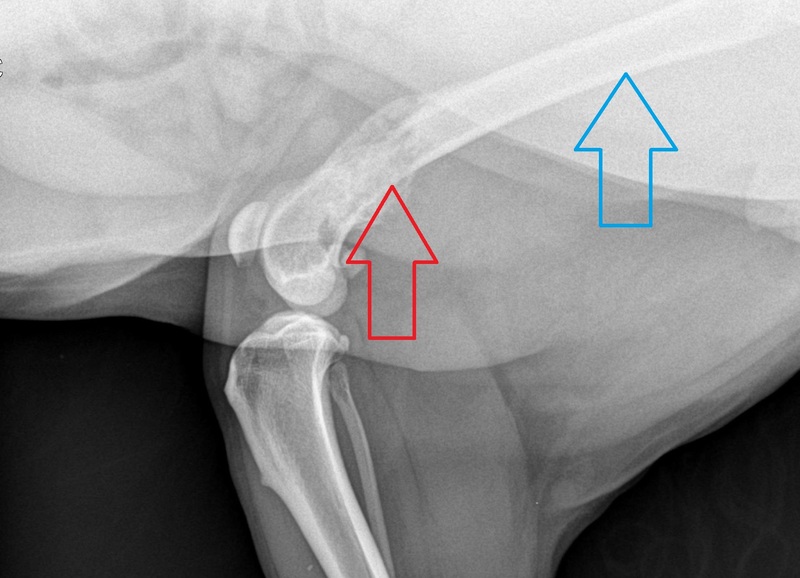 The blue arrow shows normal bone; the red arrow shows bone that has been either eaten away or that has created a mass. There weren’t a whole lot of options: the best course of action was to sacrifice the leg. 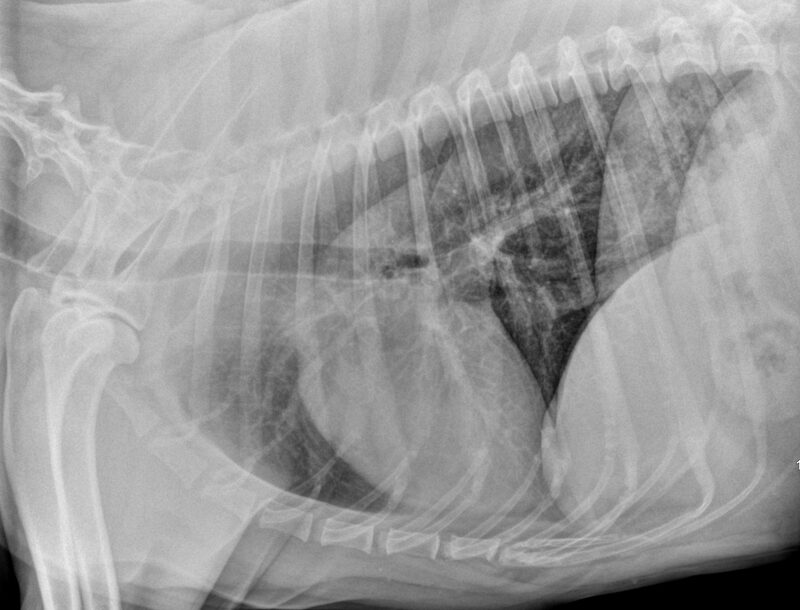 Before that, we ensured that her blood work was normal and that chest X-rays did not show any spreading of the (presumed) cancer to the lungs. A few days later, I traveled to the practice to perform the amputation. Everything went well in surgery. The very next day, Lucy started to walk around on 3 legs. She was comfortable and started to eat nicely. 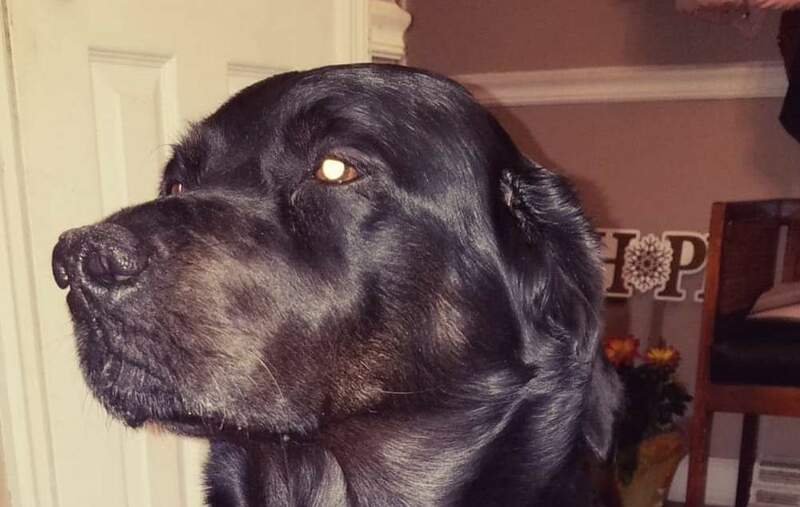 A week later, the biopsy confirmed the suspicion of bone cancer (osteosarcoma). The next step was to discuss chemotherapy, which is recommended in the case of bone cancer. 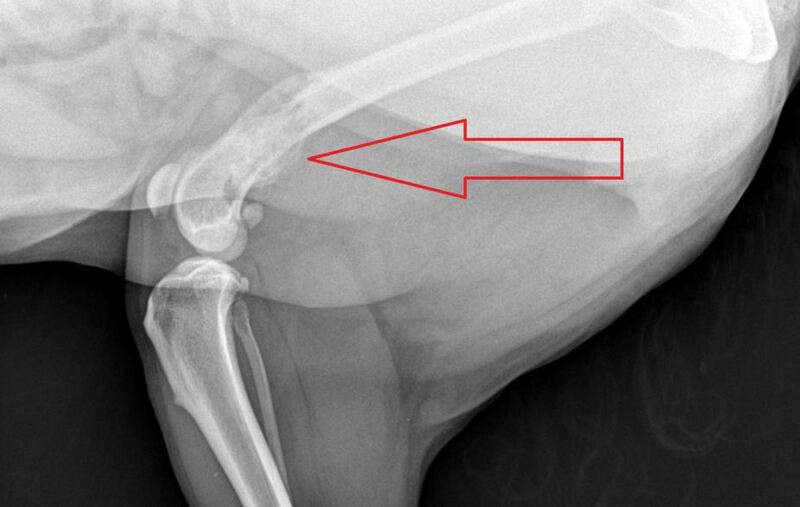 With amputation alone for confirmed osteosarcoma, the average survival is 3 to 6 months. With amputation and chemotherapy, we hope for an average survival of at least one year. When we recommend treatment, our goal is more about quality of life than quantity of life (aka survival time). Amputation is typically needed because of severe trauma or cancer – most often bone cancer. No pet owner ever opens a bottle of champagne when their pet needs a leg amputation. Yet it’s very important to understand and believe that virtually 100% of dogs and cats do great on 3 legs. 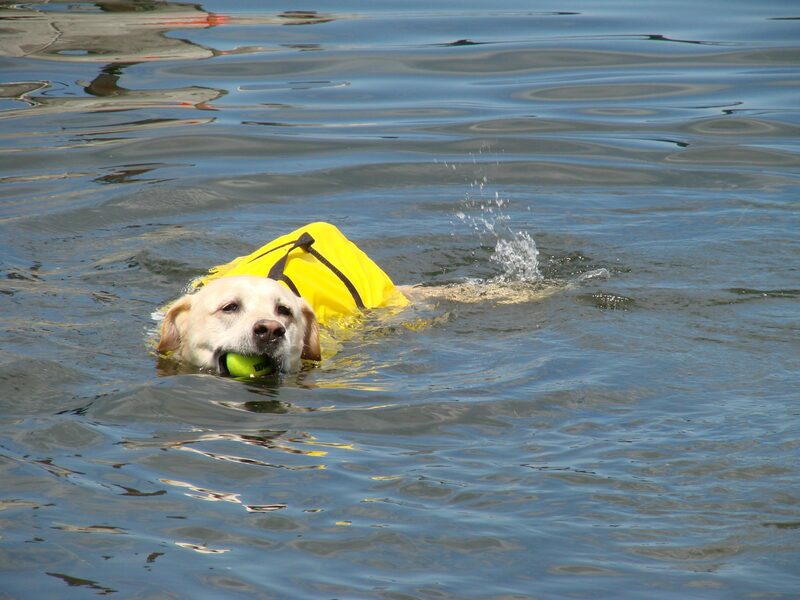 My most surprising patient, Gator, was able to swim in the pool with 3 legs (and a life jacket). To this day, I have never met a client who has told me that they regretted their decision to amputate their pet. 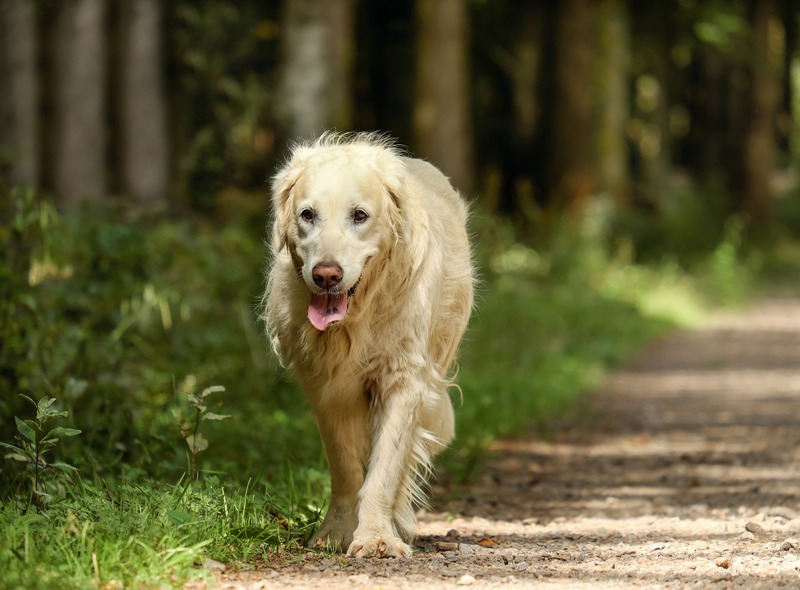 As long as we are on the same page, and we all decide as the pet’s best advocates, we typically get good results, regardless of the amount of time left. In other words, we would rather have 3, 6 or 12 months of quality life, than 3 years of misery. 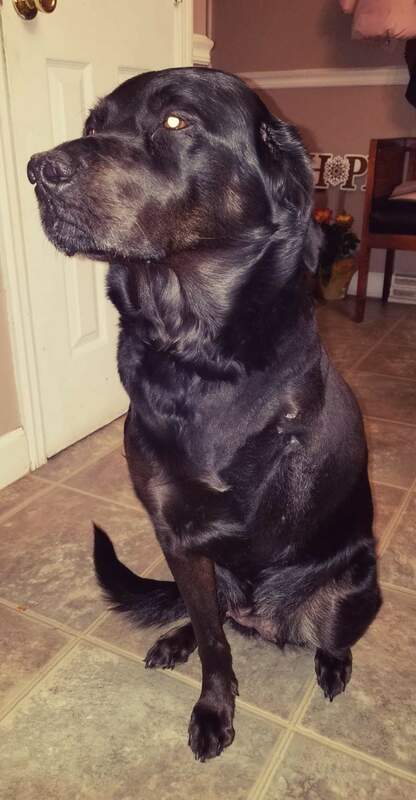 Lucy, a sweet 6 year old Golden, started limping in her left back leg. 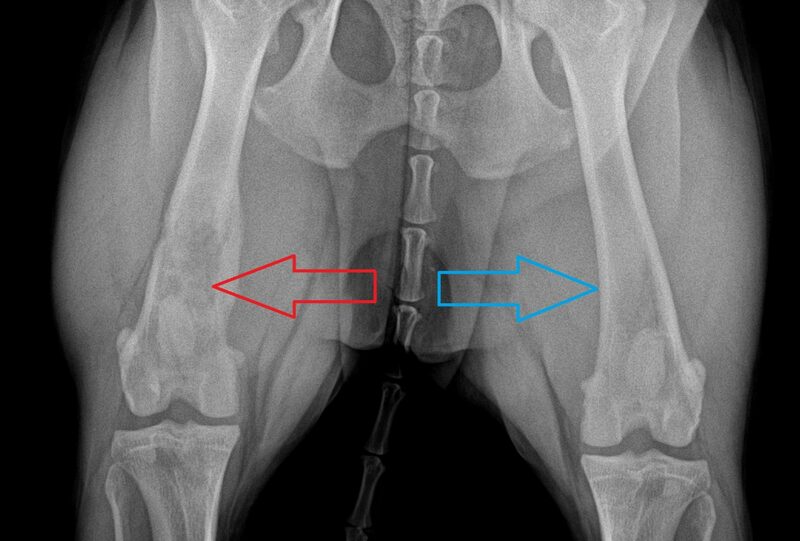 Her family vet’s X-rays showed that something, most likely bone cancer, was eating her thigh bone (femur) away (see red arrows). Amputation is typically needed because of severe trauma or cancer – most often bone cancer. No pet owner ever opens a bottle of champagne when their pet needs a leg amputation. Yet it’s very important to understand and believe that virtually 100% of dogs and all cats do great on 3 legs. 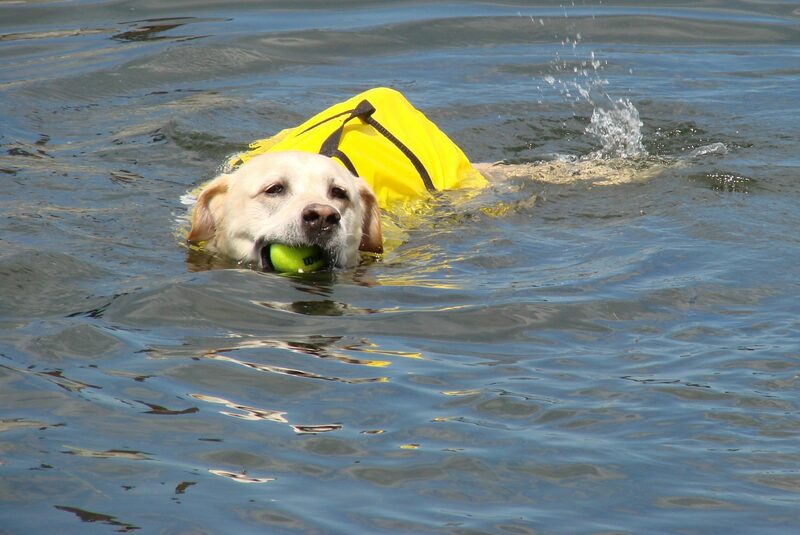 My most surprising patient, Gator, was able to swim in the pool with 3 legs (and a life jacket). To this day, I have never met a client who has told me that they regretted their decision to amputate their pet. 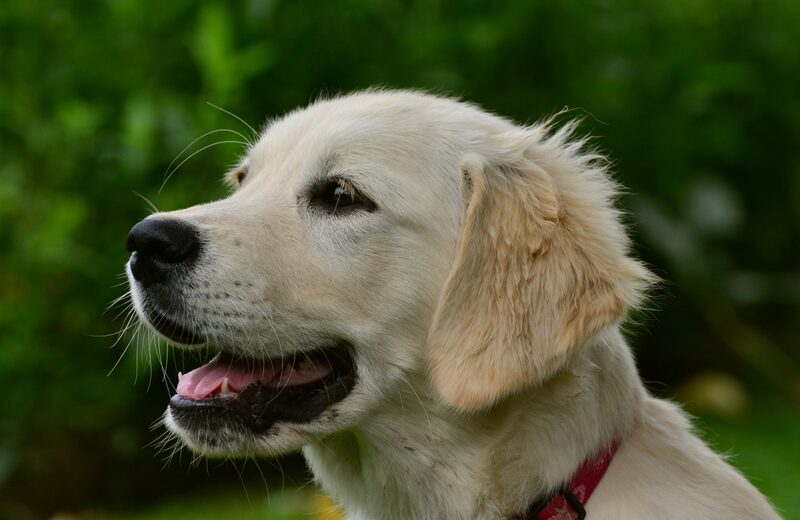 As long as we are on the same page, and we all decide as the pet’s advocate, we typically get good results, regardless of the amount of time left.